Professional Association of County Employees (PACE), Social Services Agency chapter is comprised of professionals who work for and are dedicated to providing social services to Alameda County residents. We strive for a better workplace. 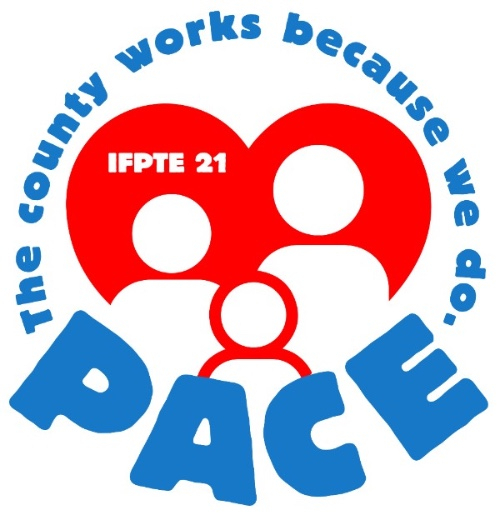 See our PACE Bargaining Bulletins here. Governor Jerry Brown recently appointed two Local 21 members to judgeships in Alameda County. Free admission, food and fun for members and their families are on tap for the Labor Day picnic at Alameda Point! Music and BBQ will be provided; bring blankets, chairs and other picnic items. 11:30 a.m. - 4:30 p.m.
On June 30,the Court of Appeals denied the stay request for the AB 197 lawsuit, which affects the retirement benefit calculations for members of both the Alameda and Contra Costa County Employees’ Retirement Associations. This is a discouraging decision in light of the declarations from both management and rank-and-file employees in both Alameda and Contra Costa Counties, detailing how employees were being forced to retire in order to preserve their promised retirement benefits—as well as the impact this could have on public services, public safety and public welfare. We have a deal! Members of the Alameda County Medical Center chapter (ACMC) negotiated a new two-year contract through January 2014. Members will receive a 3% wage increase retroactive to November 2012, and another 3% increase in November 2013. This is one of the bigger increases that Local 21 has seen in several years, and hopefully marks the start of a trend. Sharon Stewart is a Supervising Eligibility Technician with the Welfare to Work Program at Alameda County Social Services. She's been with the County for nine years and has always demonstrated exemplary performance. She loves her job and gets along well with her colleagues. Along with several other County unions, Local 21 filed a writ petition to intervene in the Alameda County Employees’ Retirement Association’s (ACERA) implementation of pension reform bill AB 340 and clean up bill AB 197 for existing employees. Initially, it sought an injunction to prevent ACERA from excluding certain categories of pay from being used in pension calculations, which it has included in the past, based on the change impairing employees’ vested rights. Local 21 members filled two tables at the Alameda County Labor Council Award Dinner Friday night. For the second year in a row, Local 21 members were among the honorees. Tom Manley, Local 21 Vice President for Legislative & Political Action, was honored for his volunteer political work, spending hundreds of hours phone banking and getting-out-the-vote in support of our candidates.